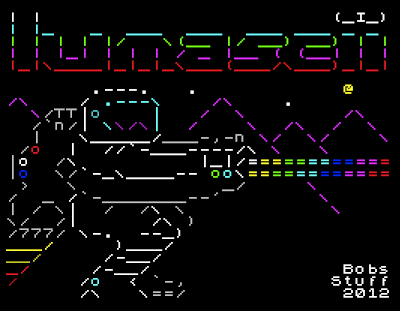 Bob Smith's latest Spectrum game LumASCII is a side scrolling shooter, with an aesthetic twist - it's all rendered in the Spectrum ROM font. 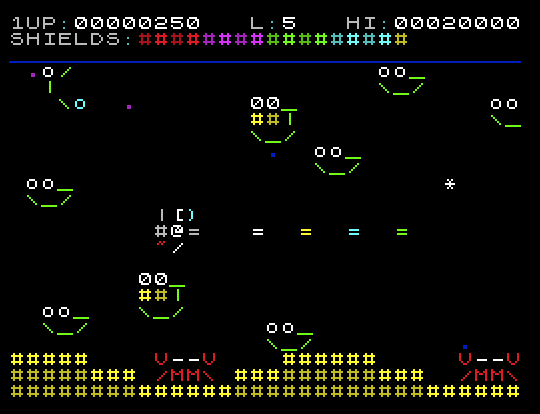 The game plays as a tricky (power-up free) shoot-em-up, with your character and all the baddies and environments rendered in a screen full of squint-tastic coloured text. (Insert your own R-'TYPE' pun here.) If you touch a baddie your energy bar is chipped away - run out of energy and you lose one of your five lives. Classic stuff. The text based 'sprites' in the game are often animated, and are amazingly recognizable given the limited palette of shapes available to draw them. Jellyfish, crabs, plants and other more abstract baddies come alive within this textual world. Graphical polish is evident, and the effort put in to make these look good shines through. Neat touches such as background star-fields (made of full stops) drift by in the background, and the main character (the wonderfully named "Chi-Chi Skyrocket") leaves a movement trail that fades as she moves around. 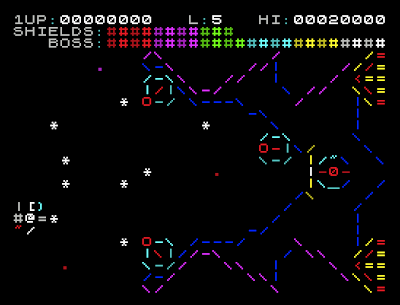 Bosses come at the end of each stage, complete with their own energy bar to eat into. 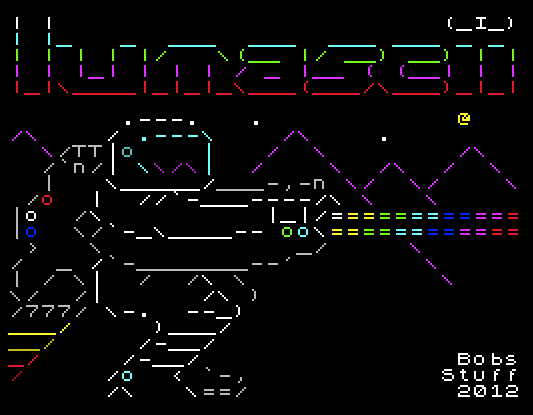 The production values are very high in this release, and continue to the loading screen, an ASCII homage to the iconic JetPac artwork. 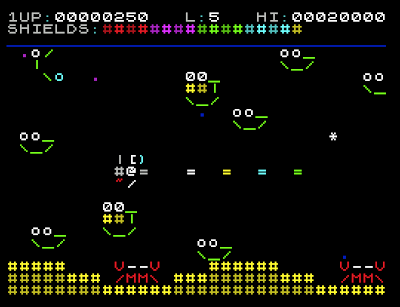 Interestingly, the scrolling being character based - something which would have been criticised back in 1983 - is a necessity here. As well as avoiding any colour clash issues, it is required because the spaces to avoid baddies and bullets are very tight! 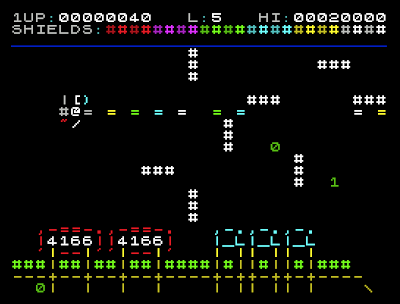 Being 'pixel perfect' to escape death would have seemed unfairly harsh, but asking the player to be 'char$ square perfect' is more reasonable, and works very well. The game - viewed simply as a game - is a simple, polished take on a classic archetype. This is lifted to a new league by its interesting art, a stiff challenge and some nice touches of humour. 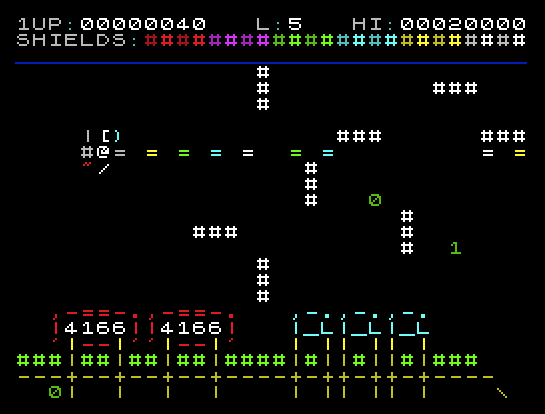 This shows, for instance, when stages feature Matrix-style backgrounds of descending green '1's and '0's, or the game tips its hat to Tetris or (a personal favourite) Conway's Life. This variety of enemies and ingenious use of the graphics - as well as slight variations on the play mechanic and bosses - will keep you playing to see what else is hidden away in the later levels. With LumASCII, Mr Smith should be applauded for producing an interesting take on a game that stands out within a very crowded genre. Notably (and in a similar way to his previous game SplaATTR) this is a game that benefits from a small screen, (or bad eyes), to make the graphics work best. 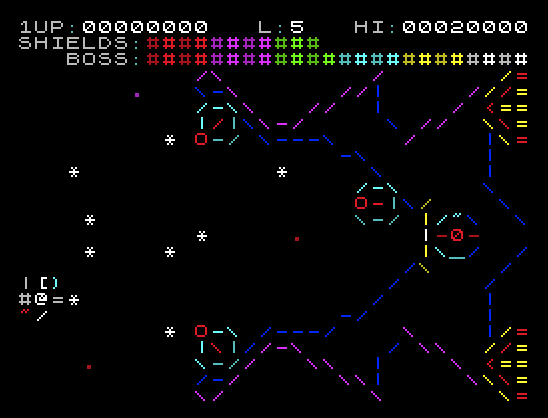 The game looks excellent played on the small screen of a handheld, but those thinking of using smartphones running Speccy emulators should note that the punishing difficulty probably requires physical buttons for the tight control needed. 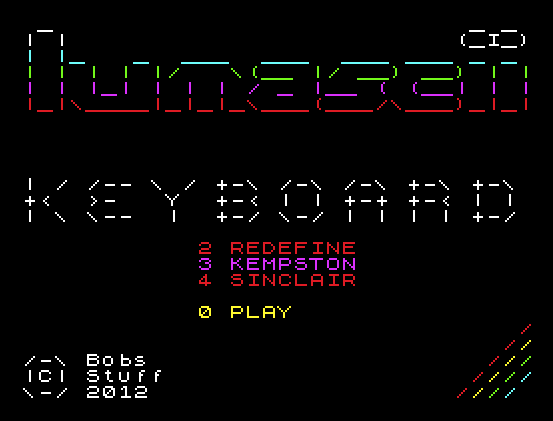 Recommended very highly as an example of the art of making a retro computer game feel special. At the very least try the free demo, to see the game in action, as still screenshots do not do this game justice at all. 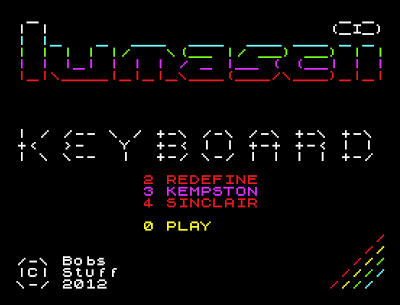 Download the 4-level demo of LumASCII here (from Bob Smith's website). Buy the full game on cassette for £3.99 here (from the Cronosoft website).